This weekend's blogpost focuses on a group of butterflies in the Hesperiidae family (Skippers) that are collectively given the common English name of "Lancer". 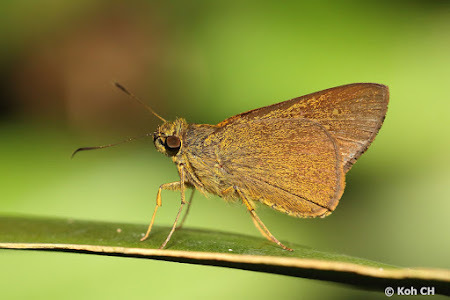 As shared in earlier posts on this blog regarding the interesting backgrounds in which the early collectors coined common names for butterflies, we have to sometimes do a bit of "forensic" analysis of some of these names to try to understand how some of these names originated. Doing an online search for the meaning of "Lancer" would turn up primary definitions like "A soldier of a cavalry regiment armed with lances" or "a soldier who belongs to the part of an army that used lances in the past." The keyword in this case focuses on the word "lance" which is usually a long-handled weapon that is in the form of a spear. So the obvious etymology of the word "lancer" centres on a military personnel brandishing a long weapon. So why would a butterfly have anything to do with a "Lancer"? This is the part that is probably more difficult to establish, and we can only speculate without any guarantees of a definitive conclusion, as there are often multiple viewpoints from which an observer can come to his own inference regarding a name. 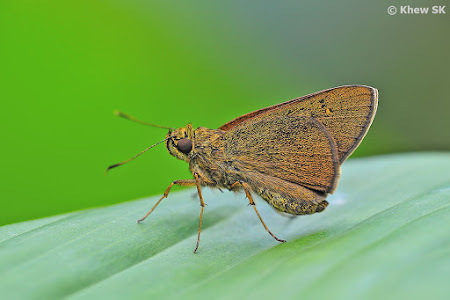 Skippers, the collective name given to butterflies of the Hesperiidae family, are usually stout-bodied, moth-like in appearance and fast flyers. The individual species that are referred to as "Lancers" vary across different genera. But like most species of the family, they are skittish and zip around with great speed. Perhaps the early collectors saw in these species, a military-like demeanour in their wing shape and flight reminding them of soldiers brandishing lethal-looking weapons? A bit challenging to try to imagine these beautiful gentle creatures in that light, but to each his own. The first species that we feature here is the Chequered Lancer (Plastingia naga). 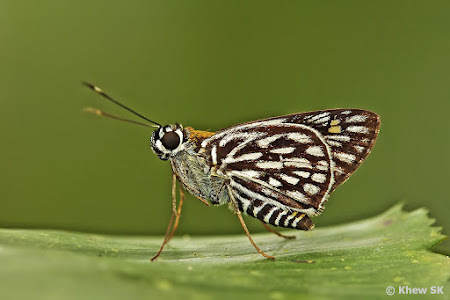 That the Chequered Lancer is referred to by only its species name suggests that the butterfly is consistent throughout its geographical range with almost no perceptible differences in its appearance across the different countries where it occurs. The underside of the Chequered Lancer has an attractive pattern of black veins and white rectangular spots. 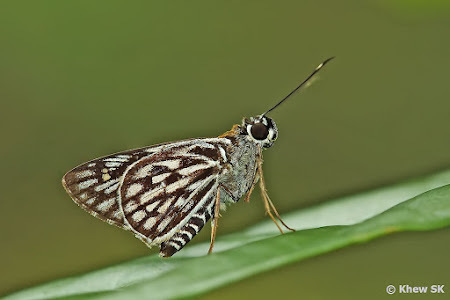 The upperside is a medium brown with hyaline spots on the forewings and yellowish streaks on both wings. 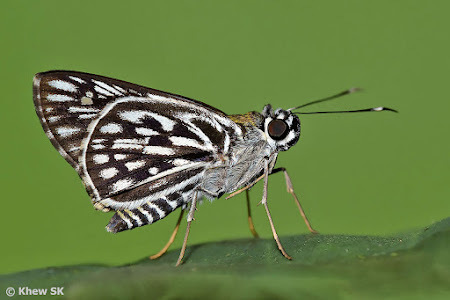 The abdomen is striped black-and-white whilst the antennaa has a whitish band just after the club. The Chequered Lancer prefers well-shaded forest habitats where it perches on the top surfaces of leaves. 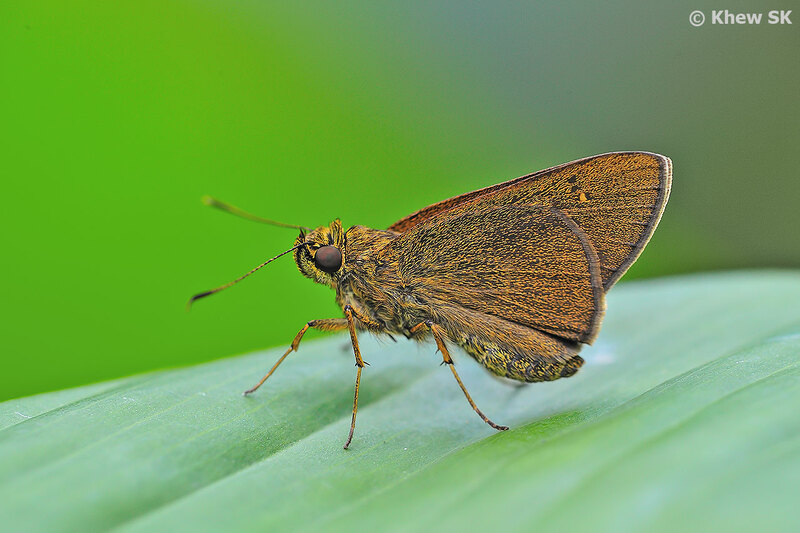 It flies off rapidly when disturbed but often not too far away from its preferred habitats. 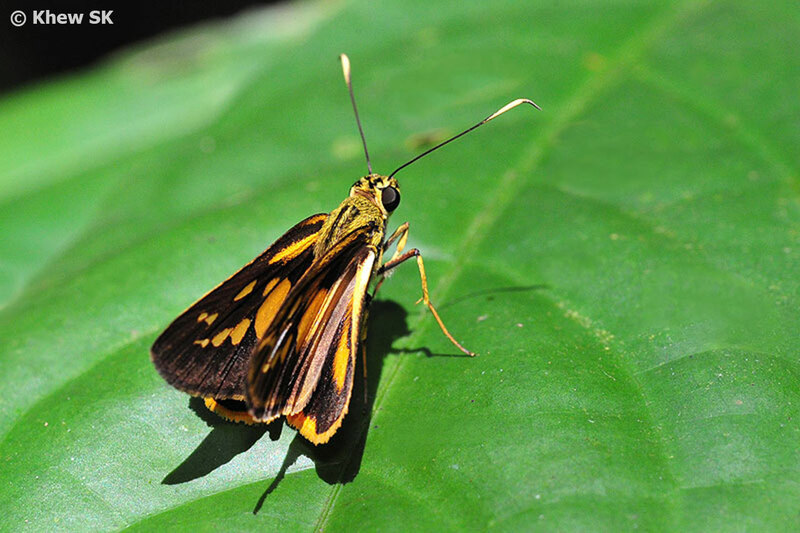 The caterpillar of this species has been successfully bred on the Fishtail Palm (Caryota mitis) in Singapore. The Yellow Chequered Lancer is closely related to the Chequered Lancer and belongs to the same genus. It can be found in the same heavily-shaded habitats as the Chequered Lancer, but is much rarer, and usually spotted deep in forested areas within the nature reserves of Singapore. 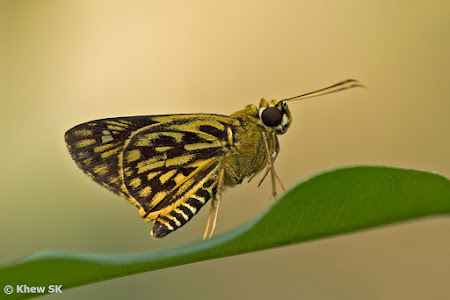 The Yellow Chequered Lancer has a similar pattern on the underside of its wings to the Chequered Lancer, but instead of white spots, the overall ground colour of the butterfly is black-and-yellow, instead of black-and-white. 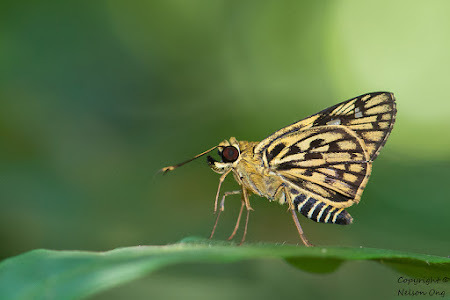 The wings above are quite similar to the Chequered Lancer, but the spots are generally larger and more prominent. 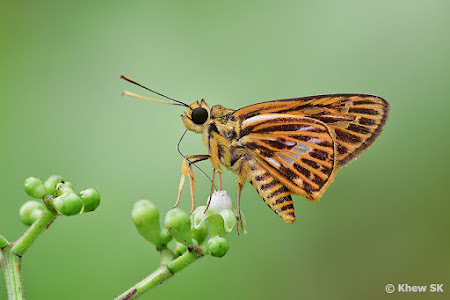 The butterfly is considered very rare and its life history has hitherto not been recorded yet. The caterpillar host plant is very likely one of the jungle palms or even rattan, and it is hoped that we can document its full life history one day in the near future. 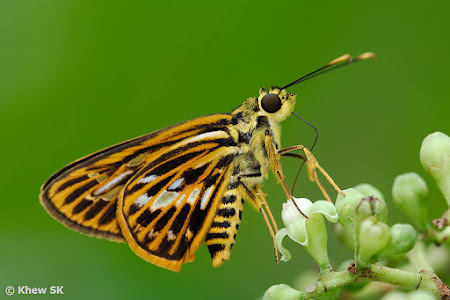 At a glance, the Yellow Vein Lancer can look quite similar to the Yellow Chequered Lancer. However, upon a closer look, the differences are obvious and the two species can be separated quite easily. 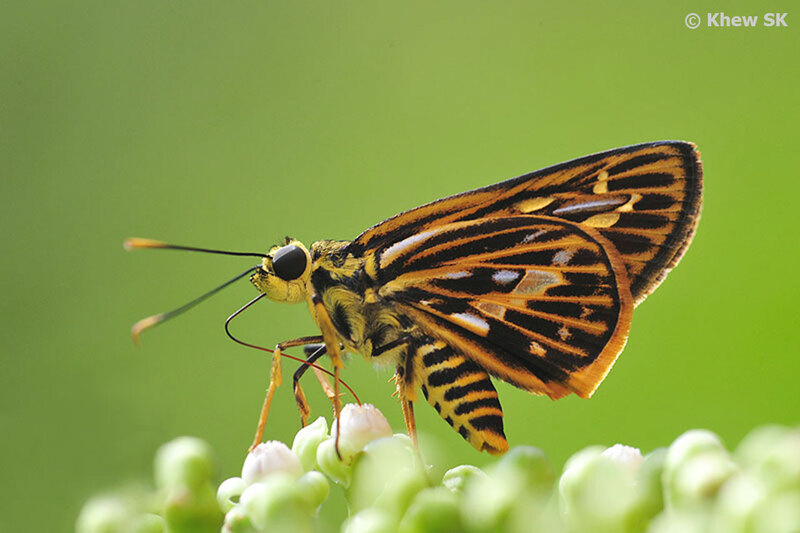 The butterfly is another forest-dependent species that is usually found within Singapore's nature reserves. 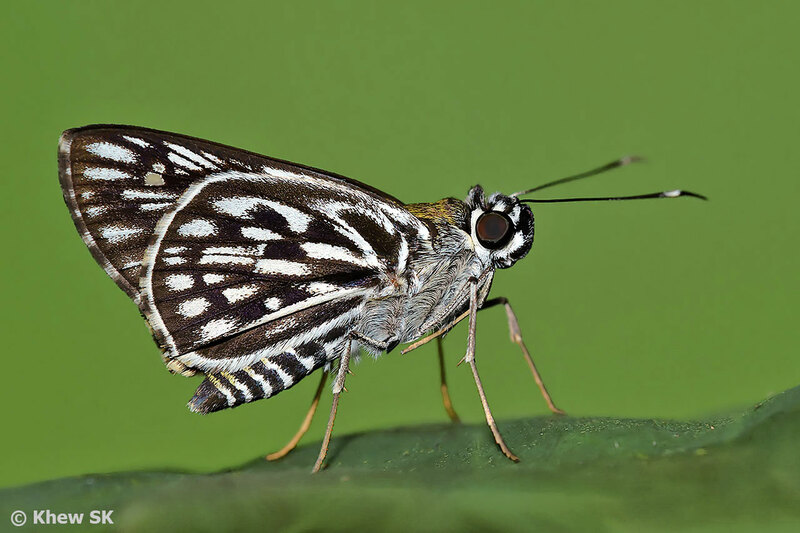 Where found, sometimes several individuals can be spotted in the same locality, especially when the butterflies are feeding on the flowers of the Bandicoot Berry (Leea indica). 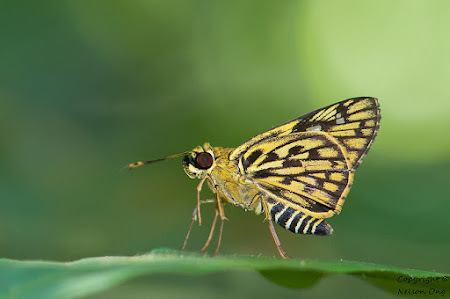 The Yellow Vein Lancer is dark brown on the upperside and the forewing has a series of pale yellow hyaline spots and streaks. 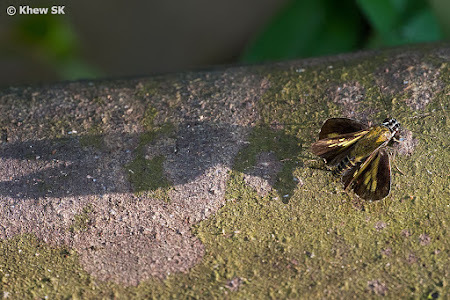 The hindwing has a series of hyaline discal spots overlaid by a yellow band. 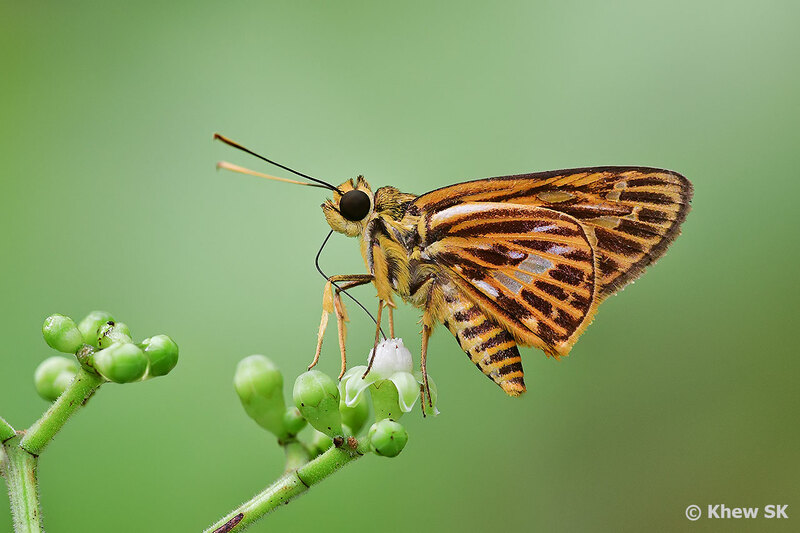 On the underside, the veins are prominently marked in yellow with large spots and streaks between the veins. 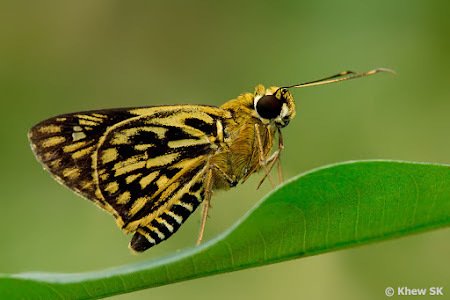 The antennae are yellowish from the apiculus to just behind the club, and the abdomen is striped black-and-yellow. The species is moderately common in the nature reserves, and the caterpillars have been successfully bred on the Nibong Palm (Oncosperma horridum) that can be found in forested areas within the Central Catchment Nature Reserves. 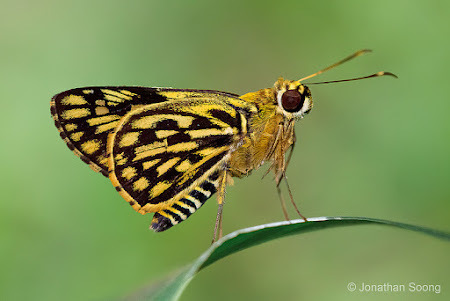 The Pugnacious Lancer is the sole representative of the genus in the Southeast Asian Region. 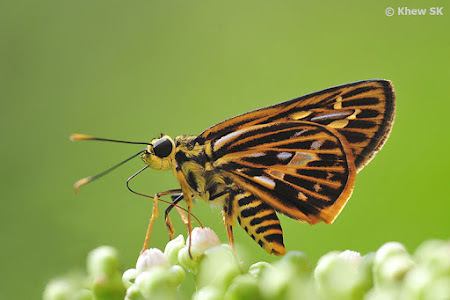 It is very rare in Singapore, and found mainly in forested areas within the nature reserves. 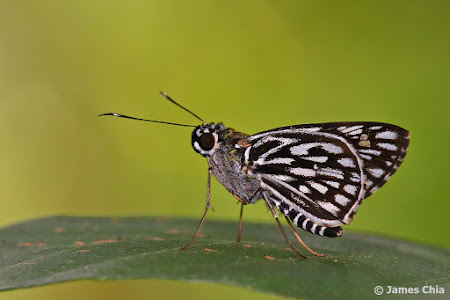 Where observed, it is usually perched on the upperside of leaves with its wings folded upright. 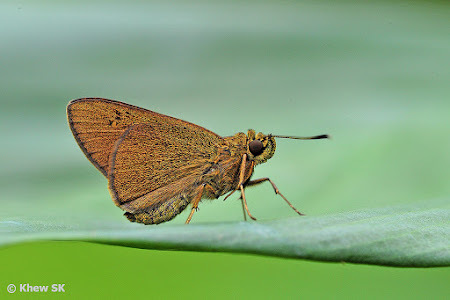 It is skittish like most skippers and tends to "jump" when it is photographed with a flash. 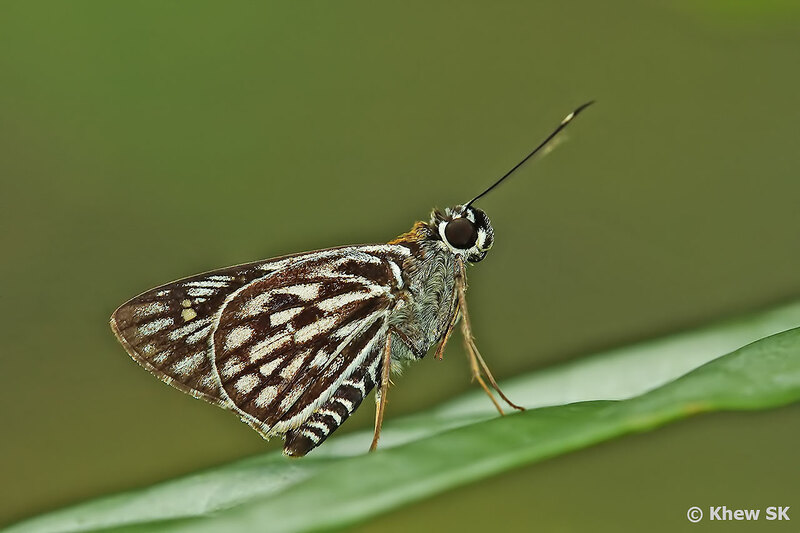 The species is dark brown above with a series of pale yellowish hyaline spots on the forewing. The underside is orange-brown and generously overlaid with ochreous scaling on both wings. 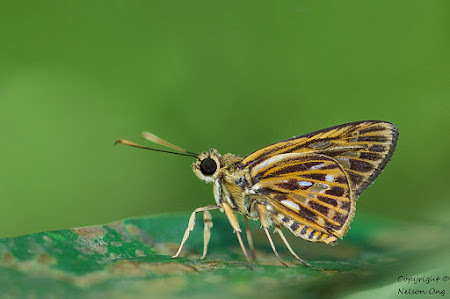 On the forewing, there is a pair of black sub-apical spots adjacent to a single yellowish hyaline spot. 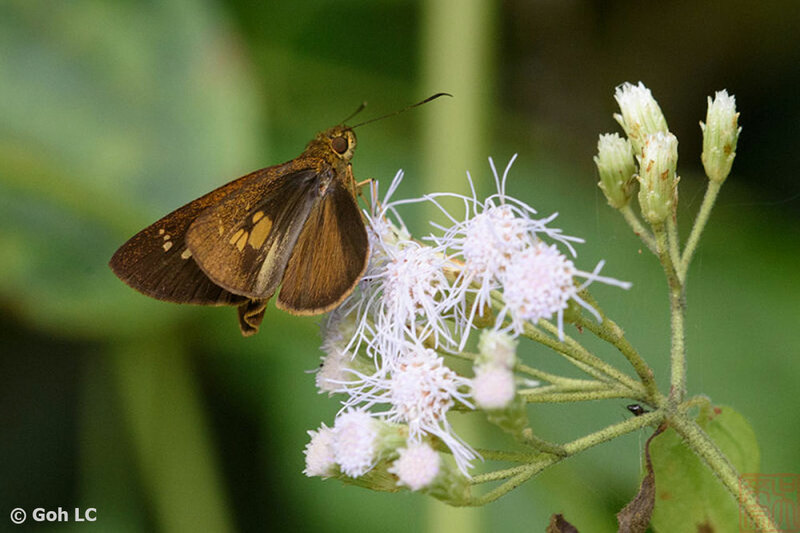 The antennae are blackish brown throughout. 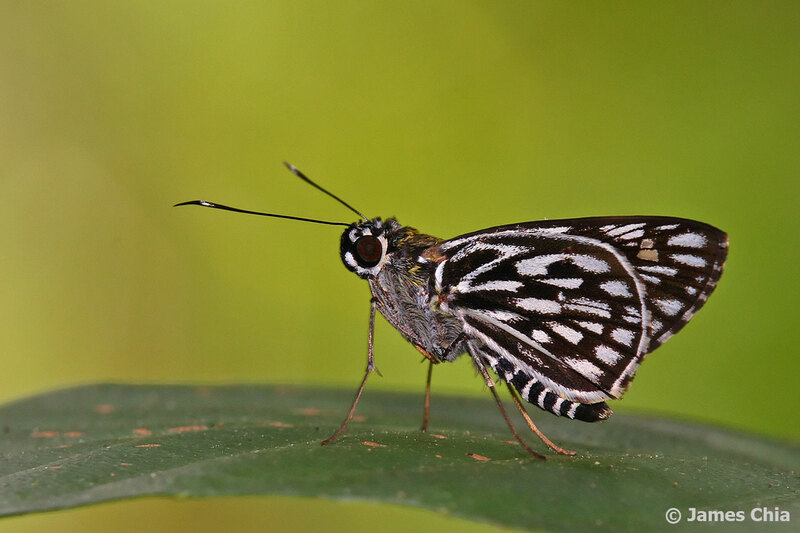 The caterpillar host plant of the Pugnacious Lancer is still unknown and given its rarity, it is hoped that a chance encounter of an ovipositing female of the species can fill in the gap in our knowledge of the early stages of this butterfly.